Pho, a popular street food in Vietnam, is a noodle soup consisting of broth, rice noodles, fresh herbs and meat. Vietnamese dishes are typically served with lots of greens, herbs, vegetables, and various other accompaniments, such sauces, hot and spicy pastes, and lime juice. It is one of my favorite foods, especially when I am craving a huge bowl of hot soup. This is a simple and impressive, 30 minute recipe that will take you to the streets of Vietnam! Get creative and play with the spice level or the types of vegetables you incorporate into your bowl. You can also substitute pork, beef, shrimp or tofu instead of chicken. In a dutch oven, heat the olive oil over medium heat. Saute the garlic, jalapeno, and ginger for 3-4 minutes. Add the chicken stock, fish sauce, soy sauce, rice vinegar, sugar, and sriracha. Bring to a boil. Reduce heat and simmer for about 15-20 minutes. Taste the broth, you may add more sriracha or salt to balance flavors. Meanwhile cook rice noodles according to package. This should only take about 2 minutes. Rinse noodles under cold water to keep from getting sticky and leave in the colander. When the soup has about 5 minutes left, add the green onions, juice from 1/2 a lime, and the cooked chicken. While the soup finishes simmering, prepare the bowls. 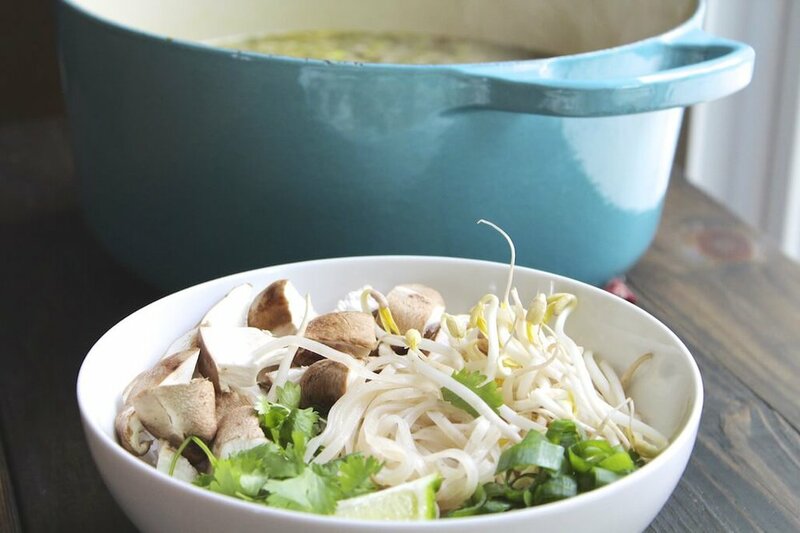 Place rice noodles, bean sprouts, and other garnishes in the bowl. Pour the broth over the noodles and serve!